The CompanyBogue Watch is an exclusive, waterfront residential development on the coast of North Carolina with homesites ranging from $95,000 to $500,000. The community offers a host of amenities, including a club house, pools, parks, a marina, fishing piers and sports facilities. Bogue Watch is owned by MVOC, a global investment firm located in Cary, NC. 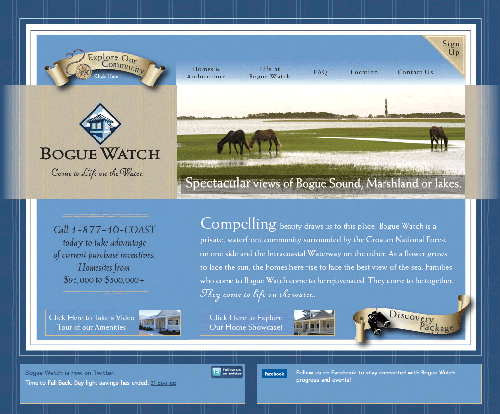 The Challenge When MVOC acquired Bogue Watch, initial marketing collateral had been developed by the original owners, including a website. The original website had many drawbacks. It was created using ASP software, a Windows proprietary software that is very difficult to use/update and requires an ASP server. This choice of software implementation greatly limited the client’s ability to modify the website. The original site was also very basic in content and scope and offered virtually no ability for interactivity for the user. The Solution The first step Bull’s-Eye took was to beef-up the content of the site and give the client a user-friendly platform that could be easily updated/modified through a Wordpress CMS interface. The Showcase Homes page was specifically created to be easily modified to include photos of new homes as they are built and fluctuating home pricing. It also links to the MLS website. The current site has much more information about the types and styles of homes and the amenities being offered. It now contains photos of actual Bogue Watch homes. Bull’s-Eye also created a site that was much more interactive with the user; a major point on the client’s wish list. The new site includes an interactive map of the community. When a user clicks on a certain lot, they get up-to-date information regarding its availability, size and pricing. The new site also integrates with today’s social media – Twitter and Facebook. The Results The client was extremely pleased with the look, content and functionality of the new site. During the six months following its launch, phone activity in the sales office increased by 57% and hits to the site increased by 600%.